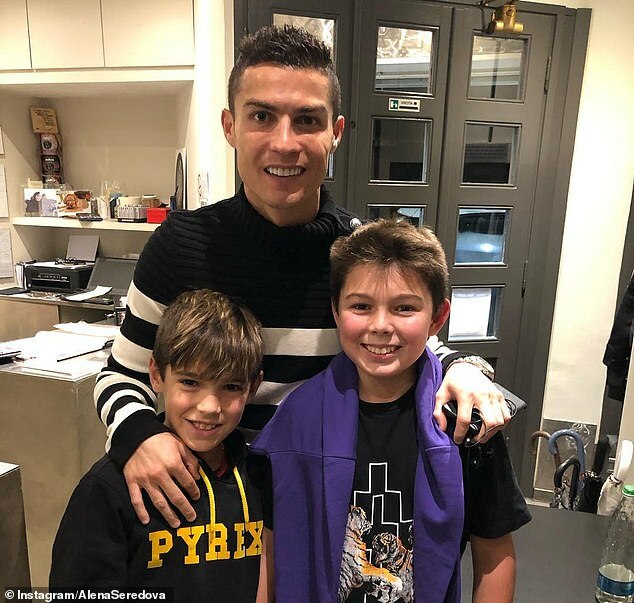 Juventus star Cristiano Ronaldo paid tribute to the past of the club as he posed with Gianluigi Buffon’s children. Buffon’s ex-wife Alena Seredova uploaded the photograph to her Instagram account, which shows her kids Louis and David Lee smiling as Ronaldo stands behind both of them. Louis is currently a player for Juventus’ Under 14s. His dad proudly represented them for 17 years before moving to Paris Saint-Germain in the summer. eanwhile, Ronaldo’s agent Jorge Mendes has revealed his surprising summer move to Juventus was organised in January. ‘He is the best player in the history of the game, so a lot of teams wanted him,’ Mendes said via Italian outlet Tuttosport. ‘Even so, Juve deserve a lot of credit for making this deal happen. ‘Cristiano told me back in January that he wanted to join the Bianconeri. At that moment in time, I did not think that a deal would be possible, but I guess that I was wrong. Mendes also revealed that the negotiations to push through a deal for Ronaldo had lasted ‘two or three months’. Ronaldo has made an impressive impact since joining the Italian giants in the summer. He scored their 5,000th Serie A goal last weekend in the game against Torino.